A second seagull has been rescued after falling into a vat of curry. 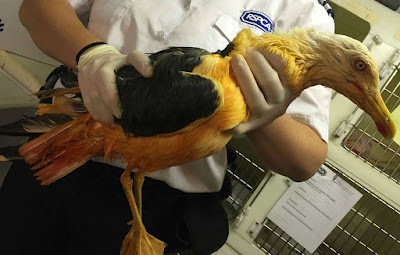 The bird fell into a vat of bright orange tandoori sauce in Newport, south Wales. It was taken to the Vale Wildlife Hospital near Tewkesbury where it was washed and is now due to be released back into the wild. The same rescue centre cared for another seagull which had fallen into a container of chicken tikka masala, also in south Wales, in June. An RSPCA spokeswoman: "We get many calls about injured gulls, especially at this time of year. "But this one was a bit more unusual than the norm. He must have had a shock when he fell in the curry. We have no idea if it flew in because it was hungry or if he fell in by accident. He's uninjured and just needed a good clean, but I expect he will be put off from curry after this." Are these big vats? Why are they out in the open?